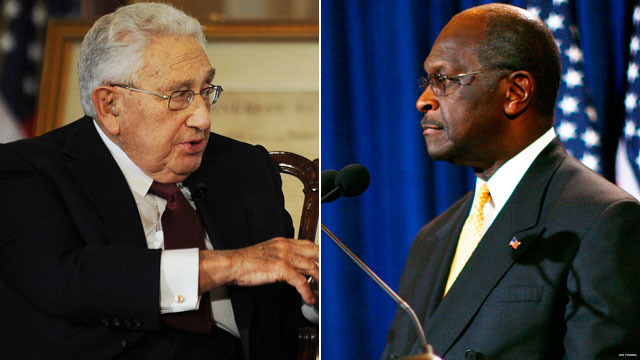 Former Secretary of State Henry Kissinger is among those Herman Cain would like to see in his administration if he wins the White House. Too bad Kissinger declined the proposal. The two met for breakfast a few weeks ago, and in a separate portion of the interview Cain drew on their conversation to answer a question about his policy toward Iran. But he said Kissinger, 88, who served in the administrations of former presidents Richard Nixon and Gerald Ford, is just one of the people he would entertain as potential Cain White House appointees. A man with no morals working for a man with no morals AND no brain.